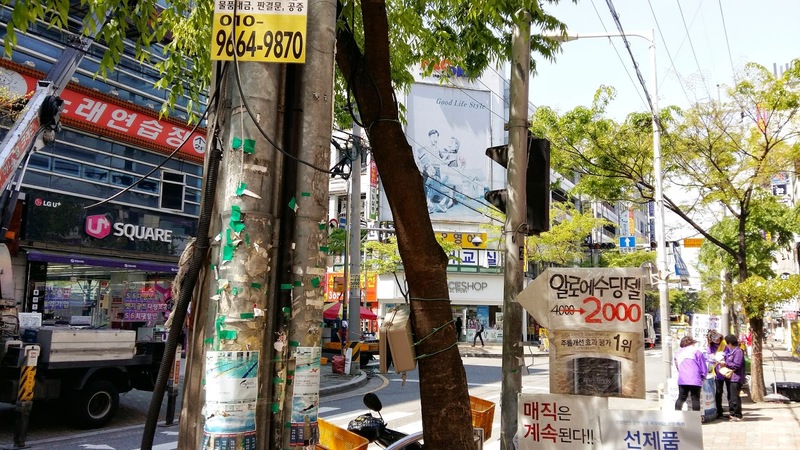 Not to quote Jason Derulo too hard (ahem…”Jason Derulo” – Jason Derulo), but the last few evenings I have been ridin’ solo through the big bustling metropolis of Busan (er – more like Ben Folds Five: “Rockin’ the Suburbs” in Hwamyeong-dong, Buk-gu). Yesterday I hit the gym before work which meant I either had a long night of thinking about food (yes – I’m back counting my calories and working the macros) or I could go on a walk and explore the area I had seen when driving back from a field trip. 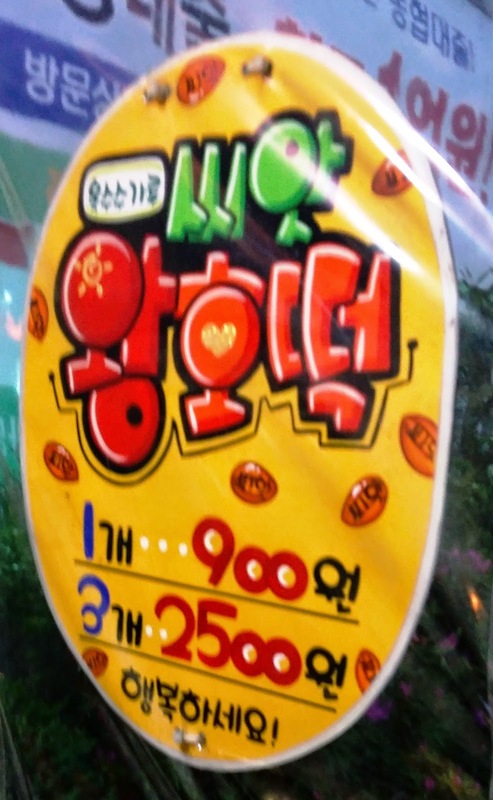 There is a lot more to Hwamyeong than what I have discovered thus far. 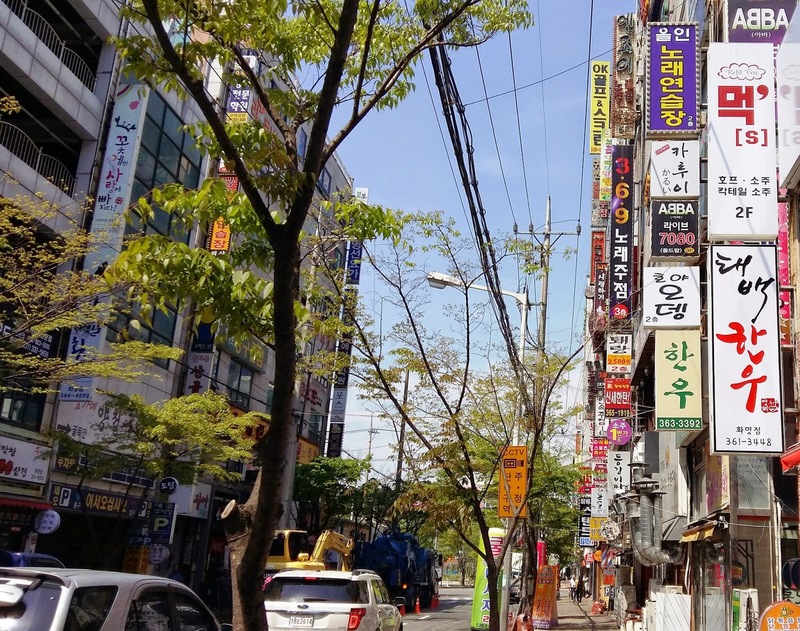 I’m sure every neighbourhood in a big city has the kind of awesome places to eat (we have some Japanese places, a couple of Vietnamese restaurants, a handful of Italian spots, a ton of chicken restaurants, and of course lots of Korean restaurants! ), the standard Baskin Robbins, Lotteria, McDonald’s, and Starbucks, as well as a ton of bars (business and otherwise), Norebangs, and local and chain coffee houses. We’re also blessed with a glow bowling alley and a movie theatre as well as a bunch of places you can go to play computer games, watch DVD’s, or play video games. My apartment is surrounded by love motels and thus far my understanding of the neighbourhood has been limited to about 4 main streets, the longest of which I decided to explore last night. I walked past the MMA gym (the owner speaks no English otherwise you know I’d be training there. at $100/ month and 5 sessions of training a week? Heck yes. 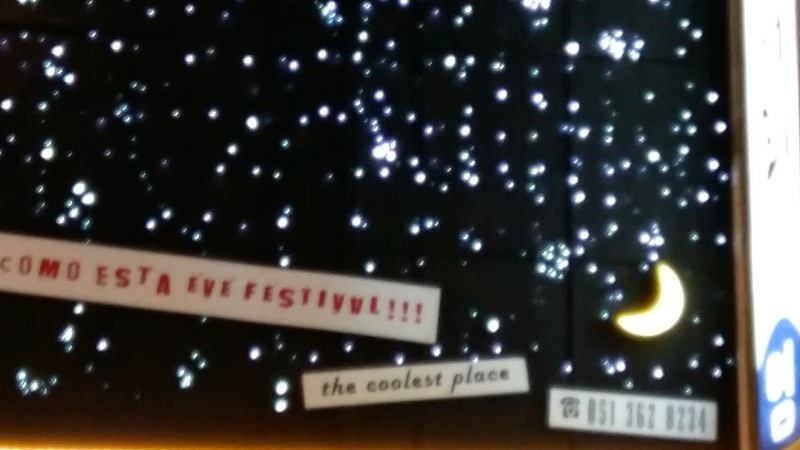 Perhaps when my Korean is better…), the Top Mart, and hit a dark patch, then a huge Church (giant LED red cross on a building that looks like a big office). I continued walking and came upon another grocery store, a few ladies clothing stores, what appeared to be a bespoke tailor, a nail salon, Bbang Ddorak Pizza, a sushi restaurant, and a Yankee Candle (which always reminds me of Angie from 30 Rock: “This is just like what I told the sales lady at Yankee Candle: ‘I AIN’T BUYING IT'”). After that I walked in the dark for a bit seeing a few restaurants (the really cool one I want to check out [pictured directly above] advertises Octopus…not sure if it sells much else) before walking by the Fire Station, a post office, a Mercedes-Benz dealership, a lighting store, a bike shop, and the biggest “Angel-in-us Coffee” I have ever seen. It took up a lot of real estate and seemed to have two levels. If it were closer I would be there all the time, but as it stands “A Twosome Place” is pretty close and is really comfortable. 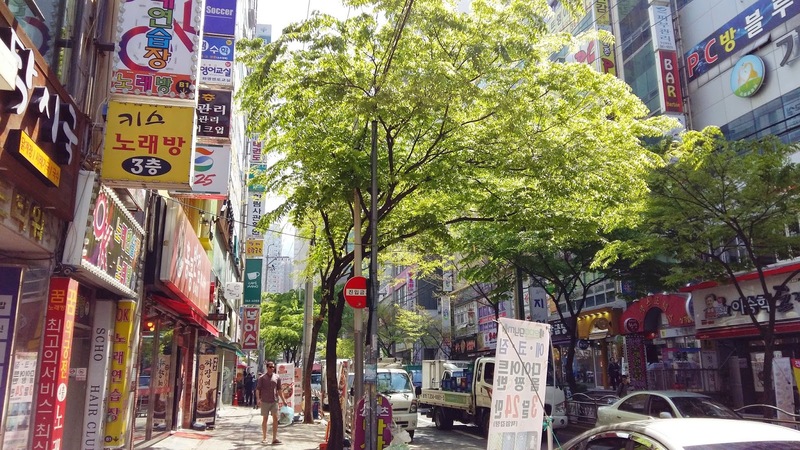 I continued on and realized that I had walked the length of 1 subway station and had landed in Sujeong. I mean…the pastries looked incredible. It took a lot to say no! At first glance Sujeong doesn’t look like there’s much other than the GIANT Lotte Castle Kaiser complex (if you think Cityplace is big then imagine 20 of them squished together). Underneath the Castle (where the subway is located) you’ll find Lotte Super (a Lottemart that is just a Supermarket), a really cool little bakery called “Bread Papa”, a “Tous les jours”, a “Paris Baguette”, and some salons and clothing stores I will more definitely have to check out on a weekend when I have some more cash. Curvy ladies – there were also two “Big Lady” (ugh – I know…) stores that looked as though they had some cool stuff! No word on price yet though. I’ll have to get back to you on that. I’ve found that I can fit into Medium or Large in Korean clothes pretty well, but if I want pants that aren’t from H & M I may check these stores out. 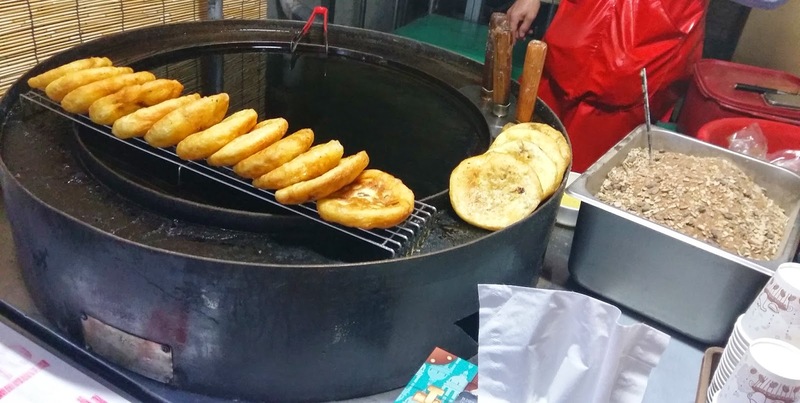 Speaking of big ladies…I might become a REALLY big one if I give into my Hotteok cravings more than once a month. I gave in last night. These things happen. 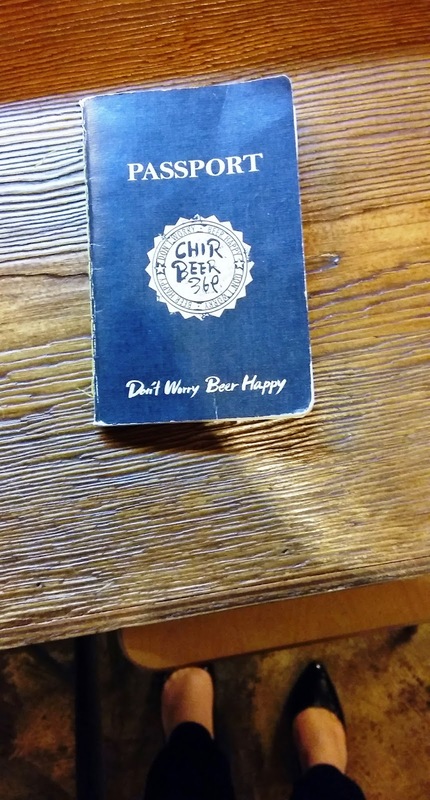 Tonight I had plans to head out on another mega-walk with a friend of mine and her pup but she had to stay late at work so I took myself to a chicken place I had been wondering about for a while called: “Chir Beer 369” (get it – Cheer Beer? Perfect for a retired Cheerleader!). With a slogan like: “Don’t worry, Beer happy!” how could I resist? It’s just on the other side of the small “Rose Park” near my place, and a hop skip and a jump from work, so I ordered some take-out and took a seat at the bar. The decor is adorable with many handwritten notes on the window and walls with decals of London, Paris, and New York (we’re working on Toronto and Vancouver…okay, I am). The owner walked in with two ridiculously adorable children who I assumed were his. WRONG! Another man walked in and did a double take. As the only person in the restaurant (and a foreigner at that) I attempted a nod/ bow as best I could seated and attempted an Anyong-haseyo. Then I got a chuckle, but not for the reason I initially though. The guy was from California, and those were his kids! Turns out he and his wife live nearby and they had had some dinner at a goki (meat) place next door. They sat down, had a beer with me, talked sports, English, business, and social dynamics, all in between quips with the restaurant owner and beginner English with the kids. I really hope I’ll get the chance to see them again as we had a lot of laughs and we all seem to have some common interests. The little girl even gave me a huge hug goodbye (aw!). Down to what you really want to hear: How was the food?! The chicken was fresh, moist, and tasty. This was boneless chicken (white meat only) with a mildly spicy breading and honey mustard drizzle. I haven’t been super partial to fried chicken here as there always seems to be some sort of mystery coating (I have yet to tell you about the “Snow Queen” Cheesy Fried Chicken – that’s a story for another day) or there are just too many tiny bones to properly enjoy the meal. Thus far I have been pretty loyal to Monster Craft, but this might just be my new go-to bar for chicken, potatoes (cheesy fries, anyone? Uhh…cheat day? :P), and salads. They seem to use fresh ingredients (at one point I saw the owner don some plastic gloves and start grating what looked and smelled like Reggiano cheese) and the restaurant itself is clean. They offer an array of bottle and draft beer (Heineken on tap means we need to frequent this place more) and have comparatively good prices for Busan and for the area (so it’s good value). I’ll have to translate the cocktail menu, but they seemed to be decently priced too, and offered some beer cocktails which was pretty cool! I’ll actually be back on Tuesday night for a chat with the owner so I’ll keep you posted on my nibbles then!